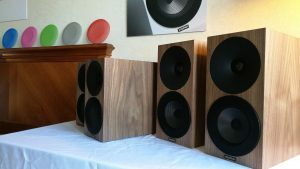 The Bristol Hifi Show last weekend was a resounding success for Auden distribution. 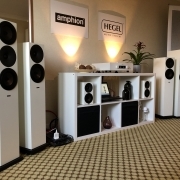 We featured Amphion partnered with Hegel to great effect, the system was easy to listen to and garnered many positive comments. Amphion and Hegel do work well together so it was no surprise to us, but we were very pleased just how good it sounded. At this years event we focused on Argon 3LS but the other models were also on display, the usual comments about how nice they look were heard many times over the course of the event. 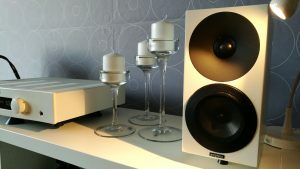 The white Hegel H190 was the heart of the system and did a fine job never putting a foot wrong all weekend, the way Hegel amplifiers grip and drive loudspeakers is always good to hear. We used music streamed from a laptop via ROON into the USB on the Hegel using Audiomica Labs cable, and fed the loudspeakers using cable from the same brand. MusicWorks G3 mains blocks and power cords were in use and all combined to create a very cohesive system that was most enjoyable to listen to. The show takes a lot of work to put together but we had a great time, thank you if you visited, maybe next year if you didn’t. 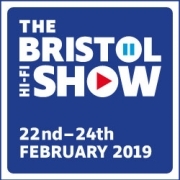 Next weekend sees the first hifi show of 2019 in the UK take place at the Marriott Hotel in Bristol. The Bristol Show is the busiest and probably biggest event in the UK show calendar and Auden Distribution will be there once again. This year we are featuring Amphion loudspeakers and partnering with Hegel Music Systems. In previous years we have had the smaller Amphion models as the focus of the system, this year we will be concentrating on the 2 floorstanding models. Argon 3LS and Argon 7LS. Amphion and Hegel make a great combination and we plan to show that you dont need a system that dominates your room to enjoy great music. As usual we’ll be using MusicWorks mains and isolation products and Audiomica interconnects. Come along to room 222, the show runs Friday through to Sunday, hopefully we will see you there. http://wp.freedomofcreation.co.uk/auden-distribution/wp-content/uploads/sites/128/2019/02/sv-box-badge-2019.jpg 251 250 Bill Leigh http://wp.freedomofcreation.co.uk/auden-distribution/wp-content/uploads/sites/128/2017/02/Auden-logo-1.png Bill Leigh2019-02-17 09:16:262019-02-17 09:19:30Scandinavia arrives in Bristol. We had a very successful Bristol Show last weekend. 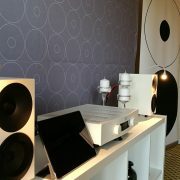 Amphion was the focus as we showed all the Argon models including the new Argon 0 and Argon 1 models. Presented in a relaxed casual manner, people were very impressed by the performance and simplicity of the demonstration system. Housed in a famously low priced piece of furniture from the big Swedish furniture store, what we wanted to illustrate was how good music can sound without the hifi taking over your room. 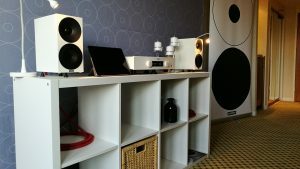 Driven by a Hegel Rost, supported by MusicWorks PEEK cones and mains block, and Audiomica loudspeaker cables, the system sounded excellent and we had lots of positive comments throughout the show. 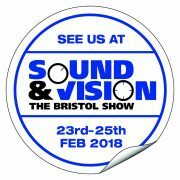 Hegel Music Systems will be once again using Amphion at the upcoming Sound & Vision exhibition in Bristol over the weekend of 23rd to 25th of February. Last year the highly regarded brand used the Argon 7LS and it was such a successful pairing they are using another pair this year. Hegel and Amphion go well together and I am expecting it to sound just as good as last year, perhaps even better. Hegel will be demonstrating their whole range of integrated amps along with the high end DAC and the superb Mohican CD player, it should be well worth a listen. http://wp.freedomofcreation.co.uk/auden-distribution/wp-content/uploads/sites/128/2018/02/sv-round-badge-white-2018.jpg 800 800 Bill Leigh http://wp.freedomofcreation.co.uk/auden-distribution/wp-content/uploads/sites/128/2017/02/Auden-logo-1.png Bill Leigh2018-02-19 09:02:352018-02-19 09:05:14Scandinavian powerhouse.